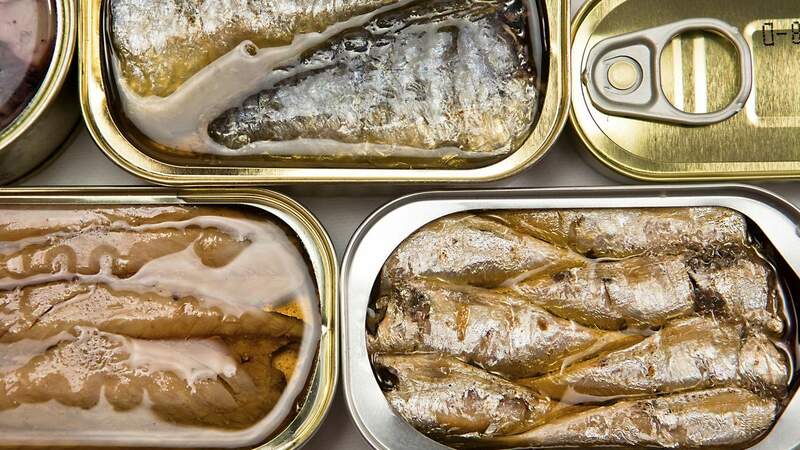 Seafood fraud – the selling of seafood products with a misleading label, description or promise – has become a widespread form of food fraud. 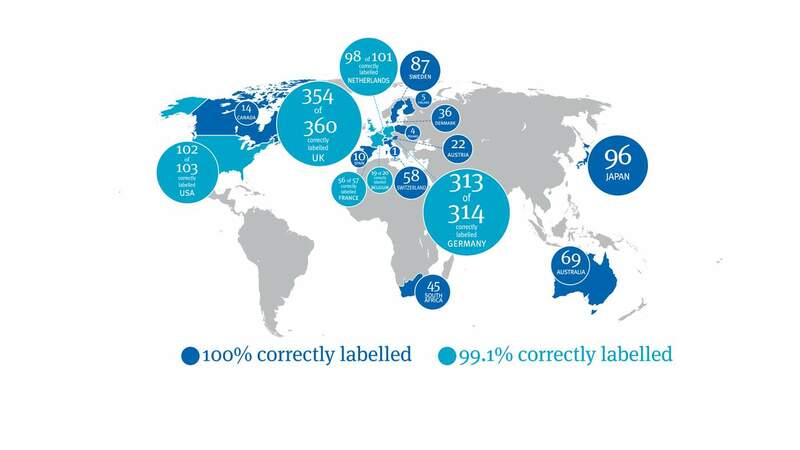 In fact a global analysis suggested that on average 30% of seafood products are misdescribed or mislabelled. Although it is possible for seafood to become unintentionally mixed at various points in the supply chain, mislabelling threatens the bottom line of honest fishers and seafood traders, it also undermines the progress being made by sustainable fisheries and can allow illegal and unregulated fishing practices to go undetected. 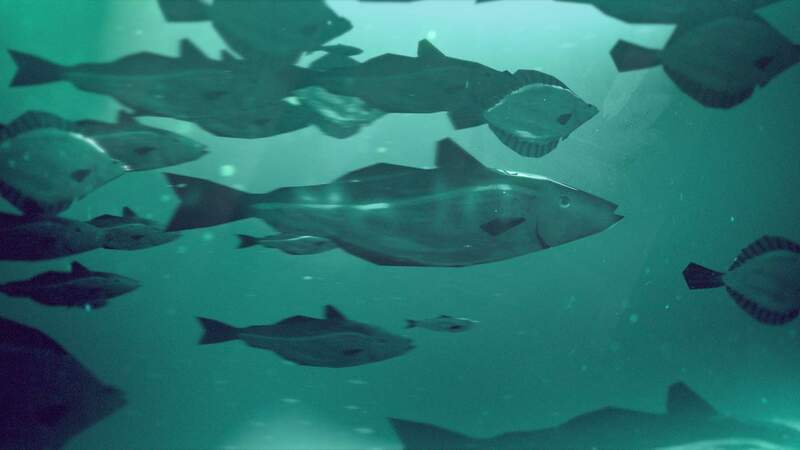 A traceable supply chain is vital to delivering the MSC’s vision of healthy oceans and its promise to consumers that MSC labelled seafood comes from a sustainable source. 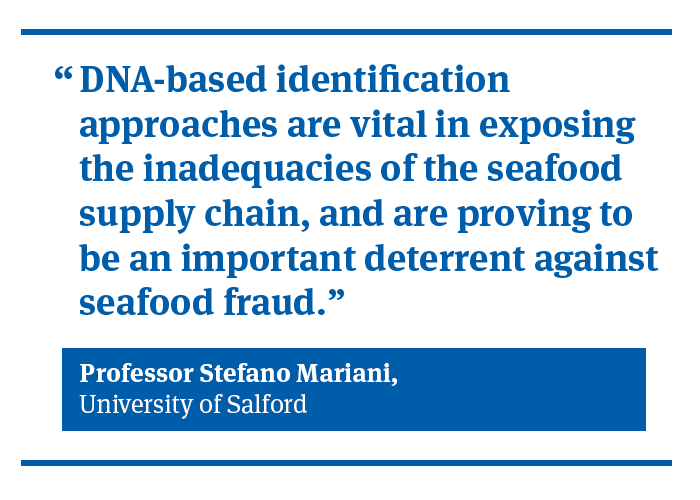 In 2013, the ‘horsemeat scandal’ sent tremors through the European food industry. The fraudulent replacement of beef with cheaper equine alternatives in burger and convenience food left consumers and retailers reeling, alarmed that they had fallen victim to the largest food fraud in decades. The scandal not only highlighted the shortcuts being made by food manufacturers in their attempts to compete for the lowest price, it emphasized the complexity of global food supply chains and the challenges in monitoring every step. 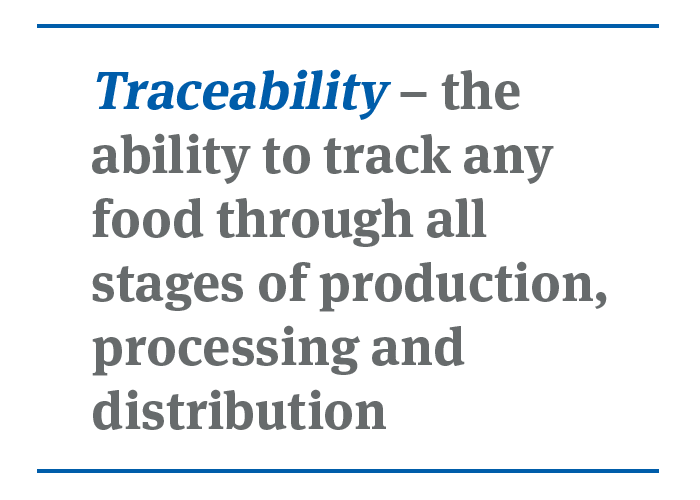 Almost overnight, the importance of traceability – the ability to track any food through all stages of production, processing and distribution – became high on public and political agendas. 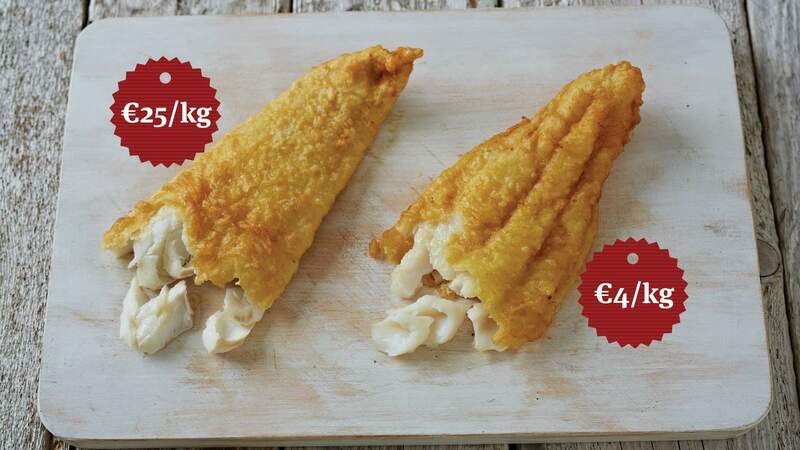 It can be near impossible to accurately identify the species of fish present in a product from sight alone, as shown by these two battered fillets of Atlantic cod (left) and Pangasius (right). 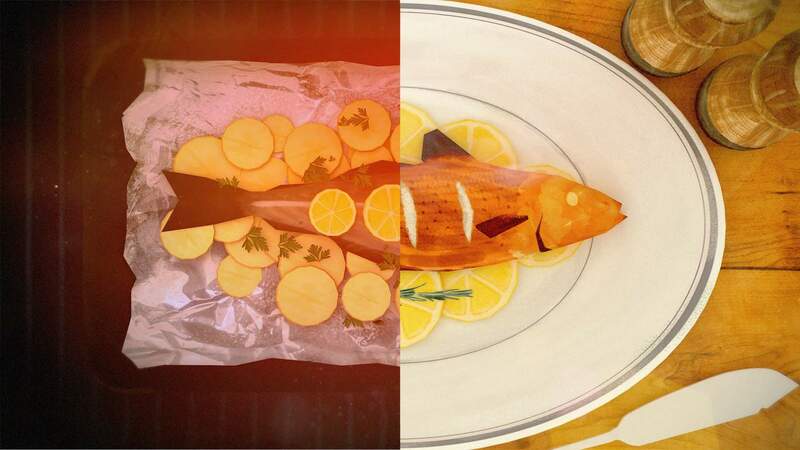 Although it is possible for seafood to become unintentionally mixed with different species at various points along the supply chain, intentional seafood fraud is motivated by profit. 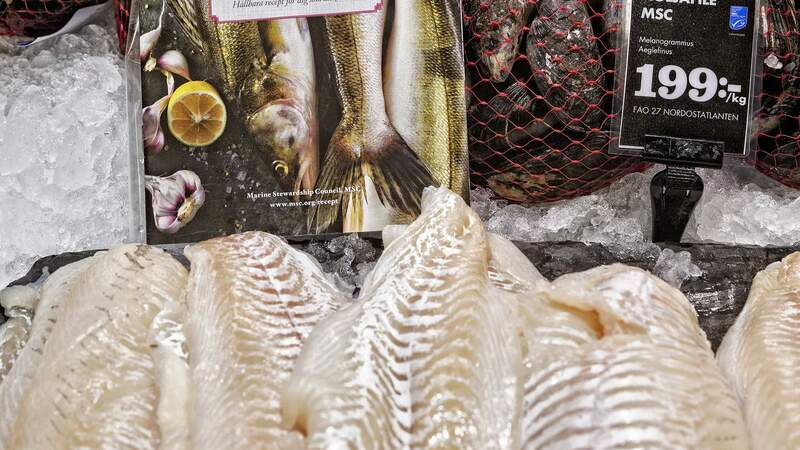 Seafood fraud occurs when one fish species is substituted for another, mainly for financial gain, without the consumer knowing; so they could be paying more for a cheaper or less sustainable. Higher rates of mislabelling have more commonly been reported in restaurants and take-away outlets than in food retailers. Whatever the incentive, the implications of seafood mislabelling can be alarming and wide ranging. IUU fishing refers to fishing activities that do not comply with national, regional, or international fisheries conservation or management legislation or measures. Illegal harvesting affect the reliability of fisheries management models and can lead to inaccurate targets being set for legally caught fish. This can potentially contribute to the collapse of some stocks or hinder the recovery of others. 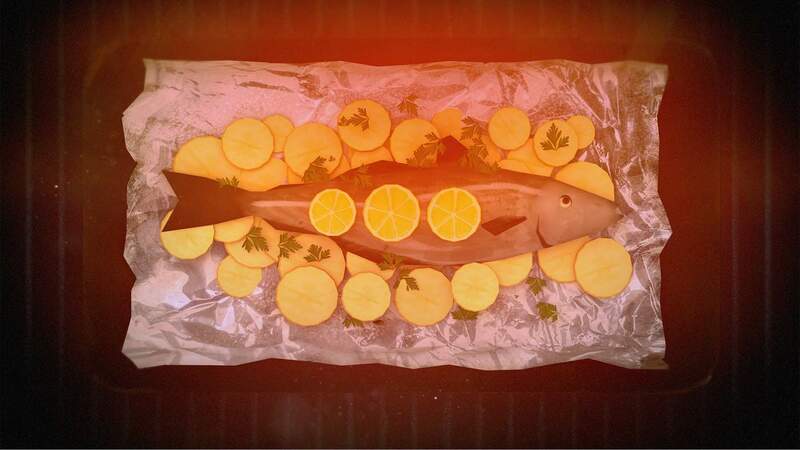 Where fish are incorrectly labelled, these consumers could unwittingly be eating options that are less sustainable, or that do not meet their ethical criteria. 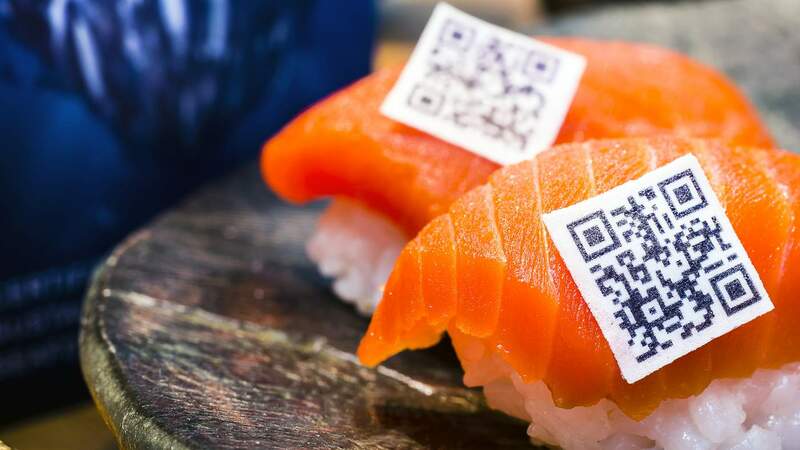 A major obstacle to the traceability of seafood in some parts of the world is the inadequate naming and labelling of seafood as it travels along the supply chain. In the USA, ambiguous names such as ‘grouper’ can legally be used to describe any one of 70 species of grouper, including the critically endangered Warsaw grouper. 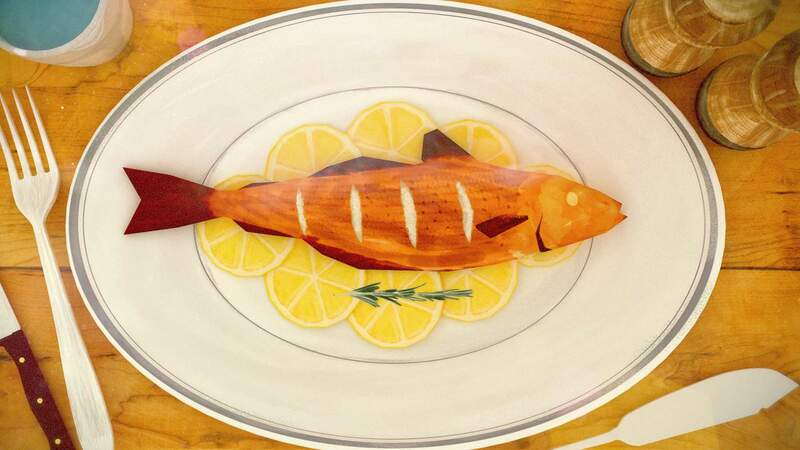 Despite the clear threats posed by seafood fraud, there is hope. 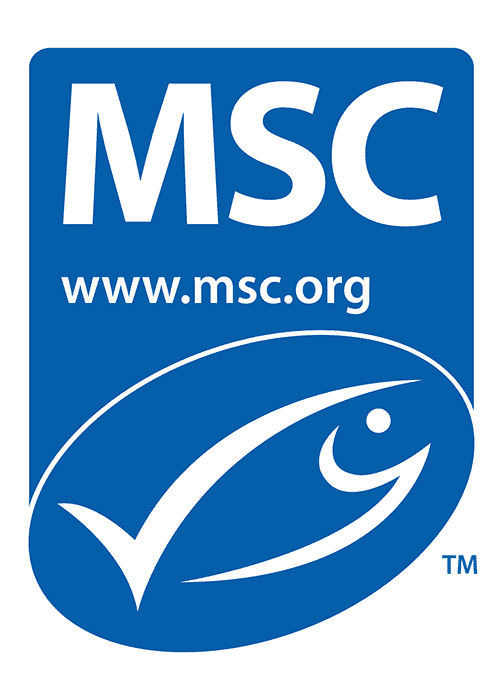 In 1999, the MSC developed its Chain of Custody Standard to ensure that every distributor, processor, and retailer trading in MSC certified sustainable seafood has effective traceability systems in place. 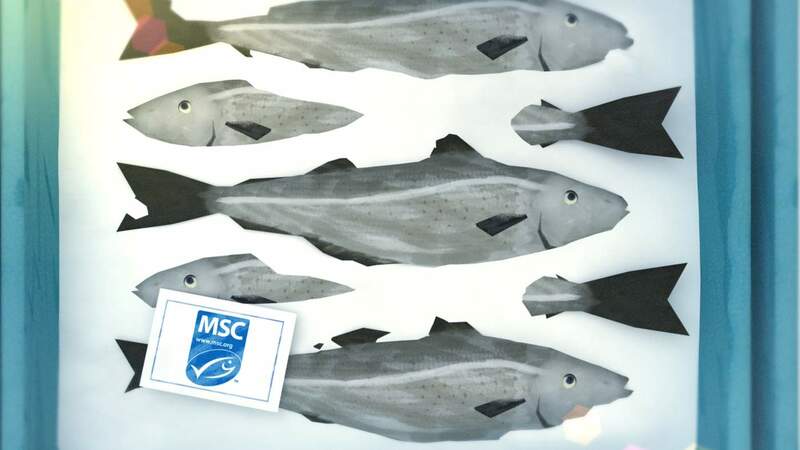 It assures consumers that the MSC labelled seafood they buy has been sourced legally from a sustainably managed source, has not been mixed with uncertified seafood, and can be traced along the supply chain from ocean to plate. Today, over 4,500 companies worldwide are MSC certified. 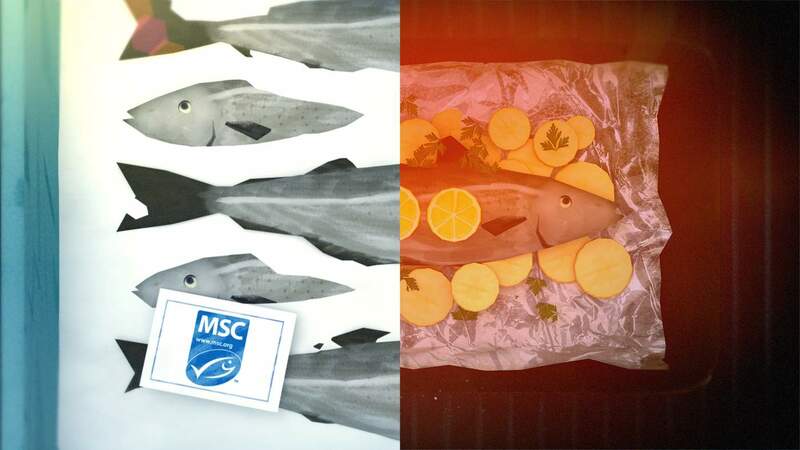 In order to sell MSC labelled seafood, each company along the supply chain must have a valid MSC Chain of Custody certificate and pass regular independent audits to retain it. 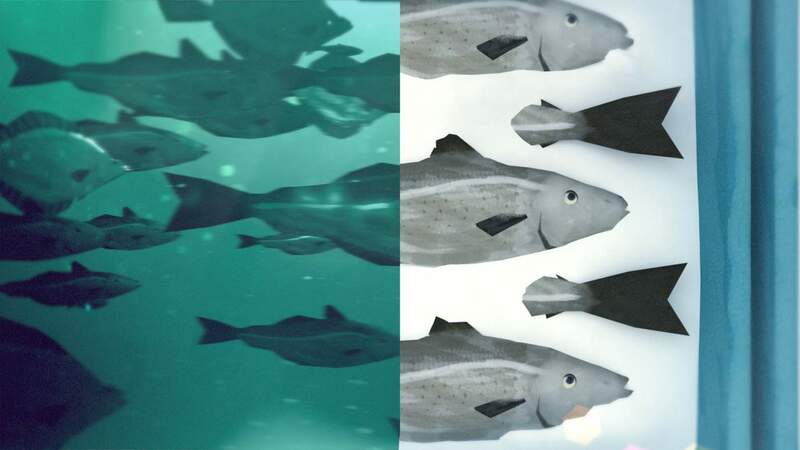 The colour, shape and texture of fish and other marine species can often be altered beyond recognition during the manufacture of seafood products. This makes it near impossible to accurately identify the species of fish present in a product from sight alone. 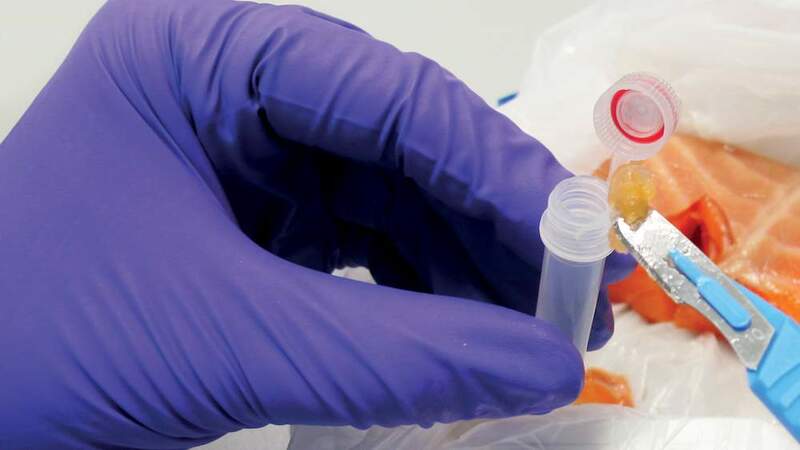 But regardless of how a seafood product is stored (fresh, canned, frozen), and what form it is in (fillet, eggs, fin, processed product), even the smallest fragment will contain a unique genetic code. By comparing a particular segment of DNA with a reference library holding the genetic codes of most fish species, scientists can identify exactly which species is present in a sample and, for some species with very distinct populations, where in the world that species was caught. Between 2009 and 2016, the MSC commissioned DNA tests on hundreds of MSC certified products, from all over the world. In combination with product tracebacks and supply chain volume reconciliations, the MSC’s DNA testing program is used to monitor the effectiveness of the MSC Chain of Custody certification program, and to verify the authenticity of products carrying the blue MSC label. 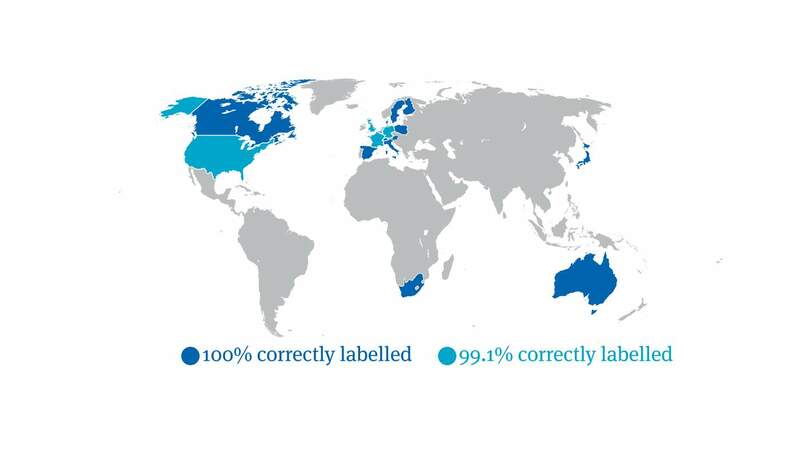 The latest tests have revealed that 99.1% of MSC labelled seafood is correctly labelled. 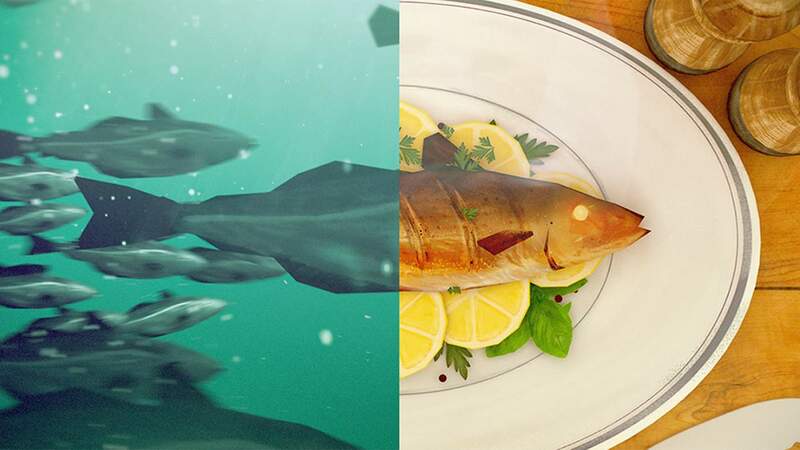 The study sampled 1402 unique products and 27 species of fish, sourced from retailers across 18 countries. Given the high levels of mislabelling found in the open market, the results of the MSC’s DNA testing program are very positive. For example, a scientific meta-analysis comparing 51 similar DNA surveys for a total of 4,500 samples of seafood (primarily sampled from the retail sector) revealed an average global mislabelling rate of 30%. Nevertheless, any anomalies are thoroughly investigated and corrections made to ensure that the MSC Chain of Custody Standard continues to be applied correctly. In the most recent round of MSC’s DNA testing program, only thirteen out of 1402 (0.92%) of products were found to be mislabelled. Tracebacks revealed that only two of the mislabelled samples were confirmed as intentional substitutions with species of an unidentified origin and thus were likely to be fraudulent. In both cases, the MSC Chain of Custody certificates were suspended. There were two cases where species were misidentified at point of capture or onboarding process. Rare instances of misidentification are inevitable and while necessary steps are taken to avoid this, they are likely to deliberate or systematic. The results of the MSC’s DNA testing program are positive. 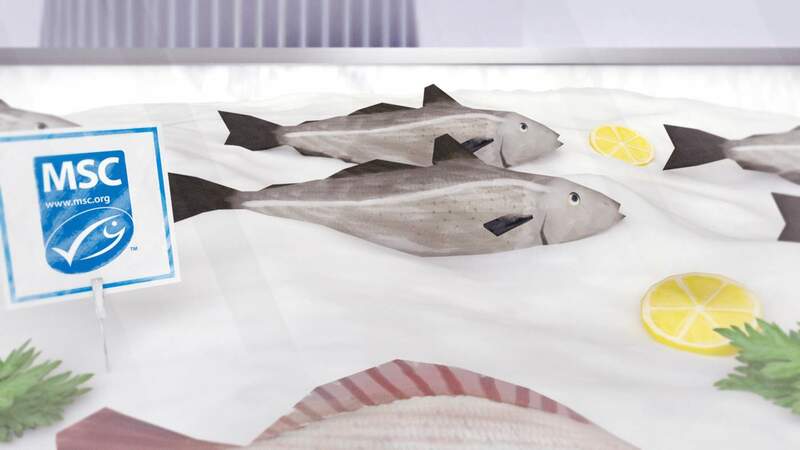 They assure consumers that the MSC seafood that they buy has been sourced from a sustainably managed source, has not been mixed with non certified seafood, and can be traced along the supply chain from ocean to plate. Nevertheless, the MSC takes traceability very seriously and continues to monitor the certified seafood supply chain very closely. 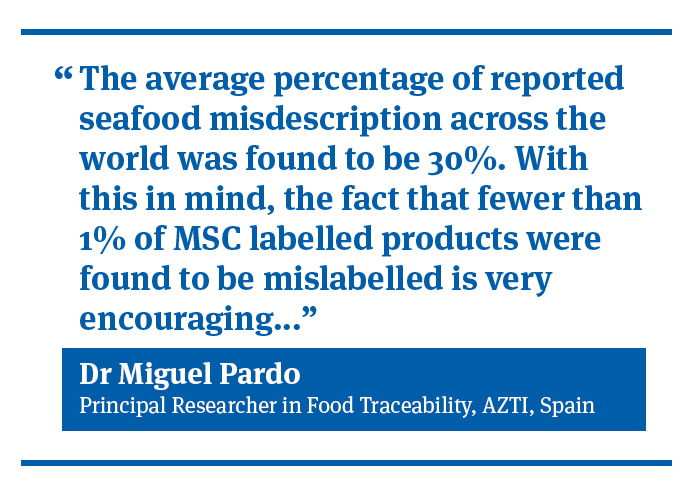 Looking to the future, the MSC will explore the use of new technologies to verify the authenticity of products that are more difficult to test using DNA.